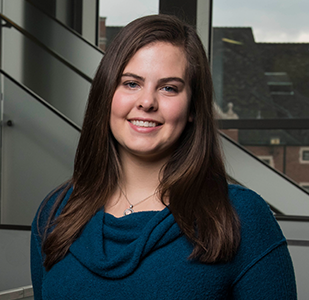 While visiting Purdue as a high school student, Sarah Rominger heard from a nursing ambassador about a clean water service-learning project. From that moment, she knew it was something she wanted to be a part of. 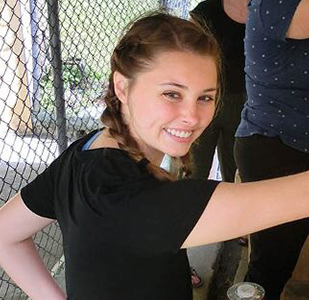 Since 2012, the Water Supply in Developing Countries course — which includes students from the colleges of Health and Human Sciences, Engineering, Agriculture, and Science — has designed, built, installed and maintained water filtration systems in communities of the Dominican Republic. “We do a trip about every six months so we can work on maintaining relationships as well as be present to check on the systems,” Rominger says. And to expand the project, in May, Rominger took her first trip to the Dominican Republic to help install the group’s third system. Working predominantly in schools, Rominger assisted in labeling the water system for ease of use and in developing educational materials about handwashing and the prevention of water-borne diseases. She also practiced skills she didn’t expect to acquire as a nurse, such as plumbing and solar power installation. And the group brought needed items, such as pencils, ibuprofen and baby scales. While the engineers worked on the water system, Rominger and the other nurses were able to visit local clinics. “It was eye-opening to see how differently the hospitals are run as opposed to those in the U.S.,” she says. “They’d reuse bed sheets. I saw up to four children sharing a hospital bed sometimes. Their idea of sterile is much different than ours. Rominger, more passionate than ever, hopes to return to the Dominican Republic as part of the December trip. From West Lafayette to Washington, D.C., Kasey Williams saw firsthand how the field of nursing can be affected on the national level. In March, Williams, a graduate student in Purdue’s Family Nurse Practitioner program, was selected to attend the American Association of Colleges of Nursing Student Policy Summit, in Washington, D.C. Students gathered to discuss the policies for which they desired congressional support. In the first two days of the summit, Williams attended educational seminars on Capitol Hill to help prepare attendees for the discussions. Speakers ranged from policy officers to those from the National Institute of Nursing Research and even Deputy Surgeon General Sylvia Trent-Adams. 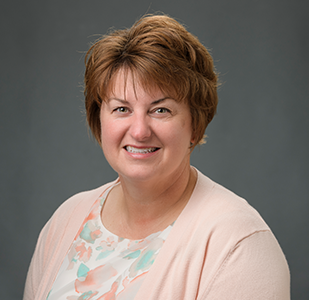 “I had just finished the health policy course for my degree, and it was nice to see what I learned in action rather than just reading and writing about it,” Williams says. On the final day, Williams and other students from Indiana institutions participated in a bipartisan open forum with Indiana legislators’ aides to ask for support in nursing research, the opioid crisis and funding for student grants and reimbursements. Through this experience, Williams says, she realized the impact of nursing and what can happen when nurses join forces with Congress to meet the needs of the nation’s people. “The summit gave us the power and opportunity to have our voices heard, and this experience never would have happened without help from donors,” says Williams, who graduated in June. “This isn’t something in my life I would’ve otherwise prioritized. But now that I’ve done it, I see how it has changed my priority of thinking. Nursing student Audrey Caprio has learned the true meaning — and value — of putting ideas into action. In April, Caprio, then a senior in nursing, and Paige LeMaster, a junior in food science, attended a student conference at the United Nations Headquarters in New York. 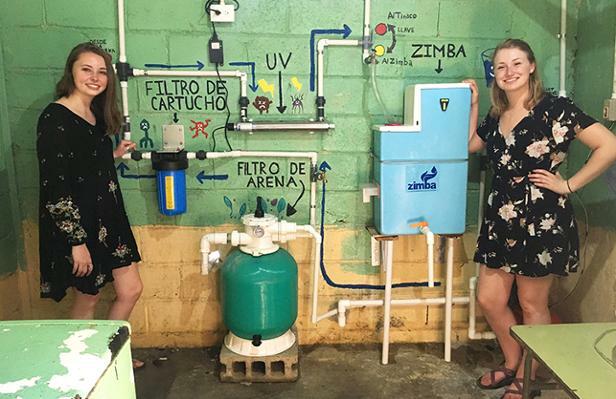 Through a poster presentation and five-minute pitch as panelists, the pair shared how they and other Purdue students have built sustainable water systems in the Dominican Republic. They were attending Students Seeking Solutions: SDG 6 Challenge with undergraduates in STEM fields to share and brainstorm solutions to fulfill the U.N.’s Sustainable Development Goal 6, sustained availability of water and sanitation for all. The U.N. hopes to meet all 17 SDGs by 2030. What struck the two after explaining their course at Purdue was that other student presenters discussed ideas, but none mentioned experiences of putting ideas into action. The course, Water Supply in Developing Countries, is the same course in which Rominger is enrolled. In addition, Caprio heard from industry leaders about ways to solve the global water crisis, as water scarcity affects more than 40 percent of people around the world, according to the World Bank. “This conference helped me realize that what we’re doing in our course is actually innovative. The clean water system isn’t necessarily innovative — we are! It was so inspiring to take back to the team and share that we’re ahead of the game,” she says. Caprio hopes to get a master of public health degree as well as a PhD. The conference solidified that this interdisciplinary and integrative work is something she wants to continue doing. Support for these student experiences came from the school’s discretionary fund — made possible through unrestricted donations of all sizes, says Pamela Aaltonen, professor emerita and former associate head of the School of Nursing. Attendance at state and national meetings. Travel for class or research projects. Participation in national organizations or health policy forums. Scholarships and financial assistance for uniforms and needed supplies. “Contributions of all sizes are vital to moving forward the school’s mission,” Aaltonen says. Check out our archives page.